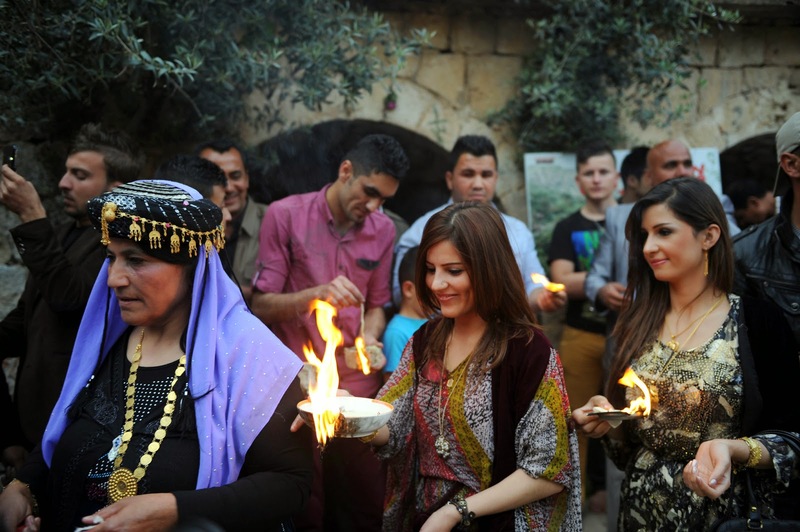 Dear Friends: The customs and traditions of Yazidi Kurds in Iraq are similar to Hindus. Their existence is at stake. ISIS is targeting them to exterminate or enslave them.Some of them have escaped to Sinjair mountain where they are trapped. Unless they are rescued very soon we may see Yazidi genocide. May activists are trying to approach US President and Indian Prime Minister to rescue them. Following Petition is being circulated for all residents in USA to sign the petition so that the President Obama may take immediate steps to rescue these trapped Yazidis. It is a miracle that this community with so close Hindu leanings even survives today in the middle of the Middle East. We have a moral responsibility to speak and do whatever we can, big or small to save this community from extinction. If anyone would like to help, please reach out to Souptic (souptikm@gmail.com) or Brennon (brannonparker.vi@gmail.com). PLEASE SPREAD THE WORD SO THAT WE CAN HIT 100,000 MARK SOON. Please contact your lawmakers to urge them to take quick action. Several activists both from Hindu and Yazidi communities are working hard to raise awareness and bring both communities together with activities such as Prayers at Hindu Temples around the world on a designated day for Yazidi community, raise funds to provide desperately needed supplies in winter at the camps in the desert, build bridges with Indian Government to provide support, help them raise their voice in many forums (UN etc). Actions of militants of the Islamic State group in Iraq’s Sinjar mountains “may amount to attempted genocide,” the United Nations said on Tuesday, referring to the ISIS onslaught in the region that has so far led to the deaths of thousands people belonging to the minority Yazidi community, according to media reports. “The evidence strongly indicates an attempt to commit genocide,” the U.N. Assistant Secretary-General for Human Rights Ivan Simonovic reportedly said in Geneva on Tuesday, after returning from a recent trip to Iraq. He added that the only options being given to the Yazidis are “to convert or be killed." Simonovic also said that he had met at least 70 Yazidis, many of whom had escaped sexual slavery, in Baghdad, and the Iraqi cities of Erbil and Dohuk during his trip. In an article published in the ISIS propaganda magazine Dabiq earlier this month, the group claimed that it has enslaved several Yazidi women and children in villages near Sinjar and sold them to its members fighting in the region. Tens of thousands of Yazidis have been forced to flee the onslaught of the Islamic State group and those remaining have been forced to convert to Islam, according to media reports. The attack is the latest threat to minority Yazidis, thousands of whom have shot, buried alive or sold into slavery by IS militants, who regard them as devil-worshippers. 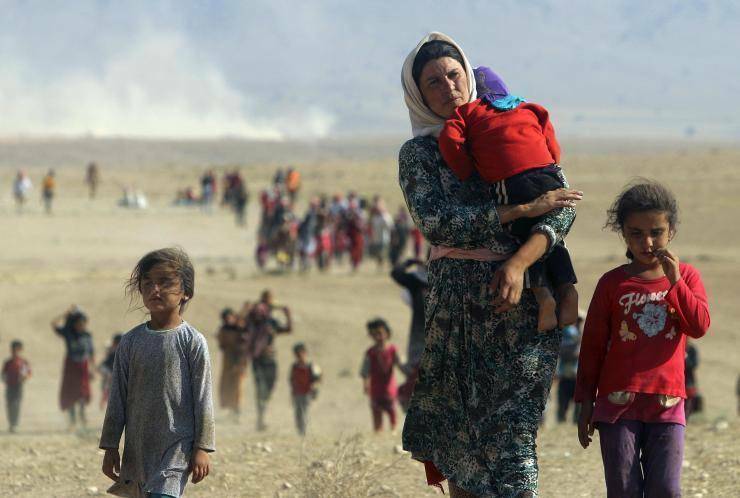 (Reuters) - Islamic State militants advanced on Iraq's Sinjar mountain on Tuesday, tightening a siege of thousands of stranded Yazidis, who called on the United States and its allies to act to avert more bloodshed. The IS militants originally attacked the area around Sinjar, in northwestern Iraq, in August. A renewed assault began at dawn on Monday, when militants driving Humvees and civilian vehicles attacked several Yazidi residential compounds, forcing the Yazidi to retreat up the mountain. "We are outnumbered and outgunned. We don't know how long we can hold them off," said Ali Qasem, a Yazidi volunteer on the mountain. Qasem said most families had already fled by the time IS arrived, but some could not leave and remained trapped in residential complexes to the east of the mountain. U.S. President Barack Obama authorized air strikes in Iraq in August, citing the duty to prevent an impending genocide of Yazidis at the hands of IS militants after they overran a vast swathe of northern Iraq. The air strikes helped Kurdish forces turn the tide against IS in the north and relieved some of the pressure on Sinjar so that a corridor could be opened to evacuate thousands of Yazidis from the mountain. However, the mountain is still under threat, and the air strikes have not prevented IS from gaining ground elsewhere in Iraq as well as neighbouring Syria, where they have been attacking the predominantly Kurdish town of Kobani, also known as Ayn al-Arab. A Yazidi parliamentarian questioned why U.S. planes were striking IS positions in Kobani but not Sinjar. He said the militants sought to control the mountain to gain a strategic refuge near the border with Syria. "Unfortunately, coalition planes are in the sky and can see the tanks, but they are not striking them," said Yazidi parliamentarian Mahama Khalil, also on the mountain. "Why do they defend Kobani and not Sinjar?" Monday's attack was one of several along the front line between IS and Kurdish forces, which runs more than 1,000 kilometres from the Syrian border to Iraq's eastern Diyala province, near the frontier with Iran. Militants disguised in Kurdish clothes tried to overrun the town of Qara Tapa in Diyala on Monday and later drove a tanker rigged with explosives into Kurdish lines in the Wana district, killing as many as 15 peshmerga, according to two officials. Wana is around 40 km northwest of Mosul, near Iraq's largest dam, which was seized by IS in August before the U.S. air strikes drove the militants back and Kurdish peshmerga retook it. A senior civil servant in the office of the Kurdistan region's president said recent IS attacks in the north aimed to divert the Kurds' attention to create an opening for another offensive against the oil-rich city of Kirkuk and Khanaqin town in Diyala. "They have strategic interests there, too, but their grand strategy is Kirkuk and other Kurdish areas in Diyala to encircle Baghdad," Ari Mamshae said. In a statement late on Monday, IS said it had carried out an attack on the "secularist Yazidi militias" and destroyed one of their shrines. "The advances are continuous and the armies that liberated Nineveh and Ayn al-Arab are taking another step towards the Mosul dam, to which the mujahideen are very close". Yazidis temples have pyramid shaped gopura just like Hindu temples. 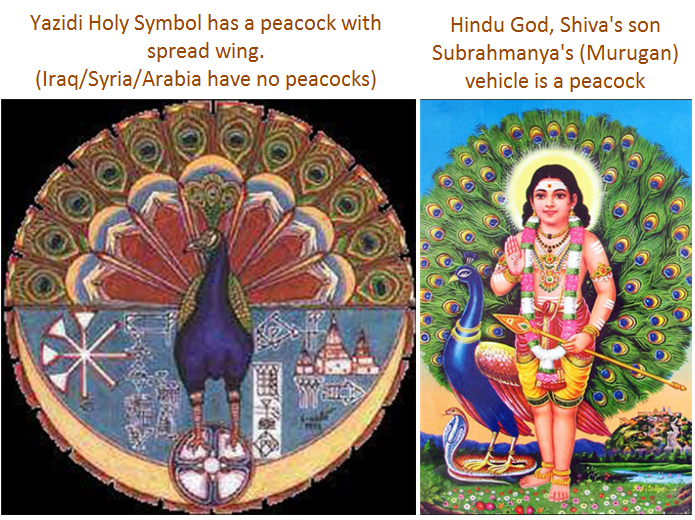 Yazidis symbol is a wing spread peacock, just like Hindu god Shiva's son, Subrahmanya's mount. The most important point to note is that peacock, the national bird of India, is a native of south and south east Asia or Africa. Not found in the area of Iraq or Syria at all. 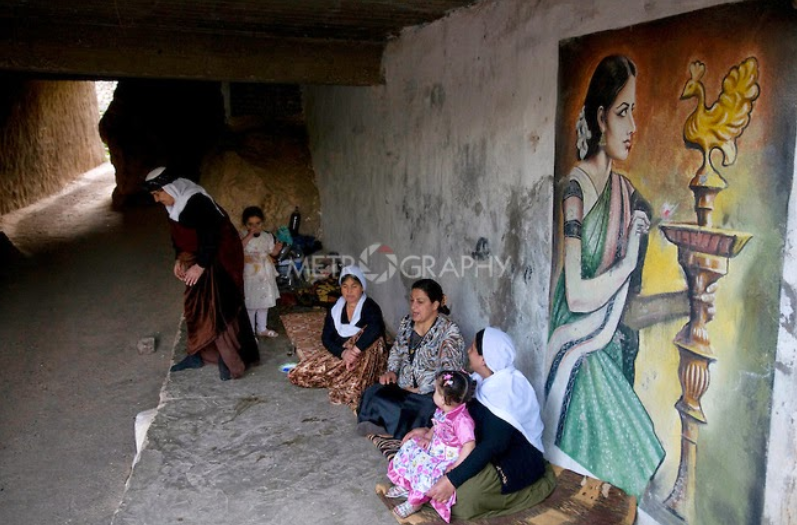 Yazidi mural on wall of their holy Lalish temple is unmistakably Hindu. You can see saree, which is an unofficial national dress of India. 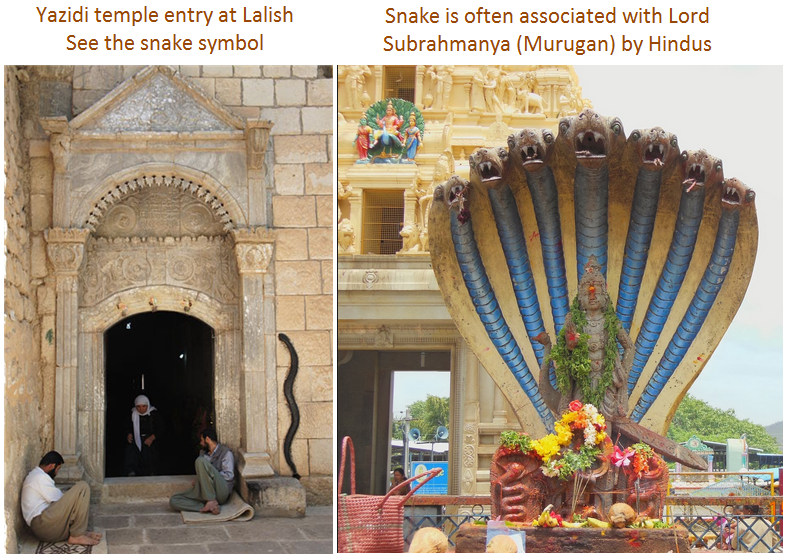 Yazidi temple at Lalish has snake symbol at the entrance. You won't find this among other tribes of Arabia or Mesopotamia. For Hindus, Subrahmanya is the other avatara of snakes and worshiped very closely for all snake related pujas like Naga Panchami. 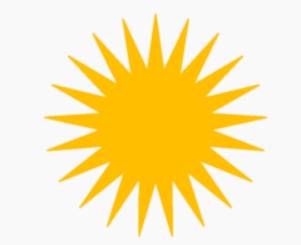 Yellow sun Yazidi symbol 21 rays. Number 21 is sacred to Hindus (Ganesha). Offerings are in 21 count like Modaka (sweet). Any Hindu with even basic understanding of aarti plate, will see Yazidis as their own. Yazidis believe in continuous rebirth and reincarnation. Same as Hindu Punar Janma concept. The Yezidis came from India is a common story for all Yezidi families Yazidis pray with folded hands. 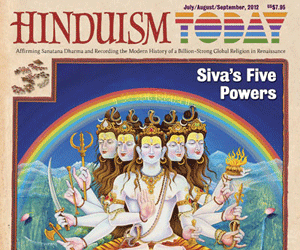 Hindus pray very similarly to their Gods and Goddesses. Yazidis pray at sun rise and sun set, just like Hindus. Both face the rising or setting sun when praying to sun. Yazidis have a symbol similar to Bindi or Tilak during temple prayer, very similar to Hindu forehead custom. 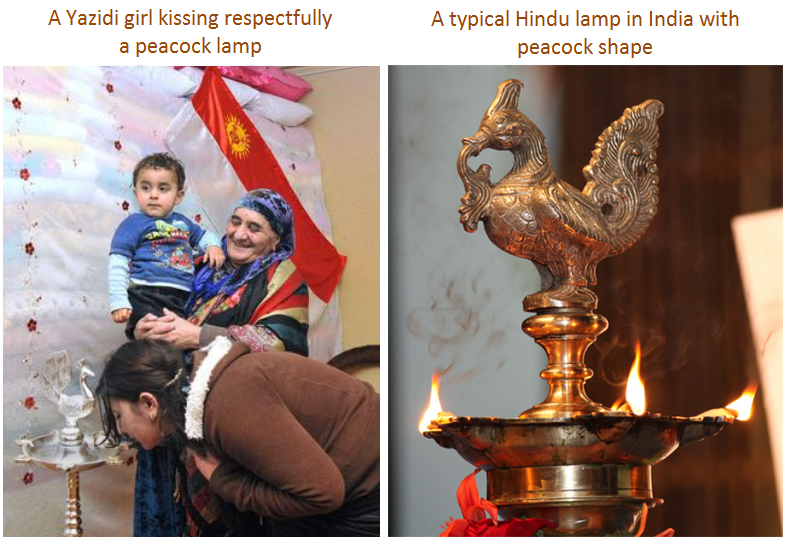 For big celebrations, lighting lamp by females common to both Yazidis and Hindus. 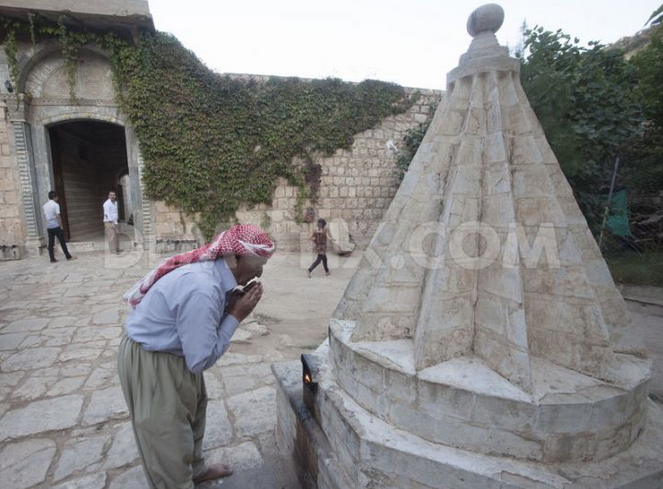 Yazidis men worship Melek Taus by lighting fire in temples. Hindus' do similar fire based worship to their Gods, with high regard for agni the fire. 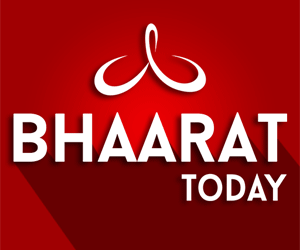 [GHHF] Christians’ plan to Build Church on Hindu Trust Land foiled; Recommendations to TTD to Build Temples in Dalit Communities and Sri Kamal Kumar Swamy’s tireless monthly Efforts.